Been to a travel agent and checked prices on a trip to Holland recently? It’s not the cheapest way to see a gazillion tulips. A much more reasonable solution is to travel to Cincinnati, Ohio. Photographing flowers is one of life’s more satisfying springtime rituals. Flower photography is something anyone in the family can do and the resultant pictures make great wall décor as a memento of the outing. 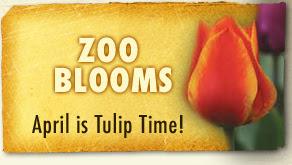 Each April, the Cincinnati Zoo comes alive with “Zoo Blooms.” Over 80,000 tulips color the walkways throughout the park. From April 1 until April 30 the tulips are at their peak and it’s a perfect time for photos. In addition to the tulips, there are over one million daffodils, hyacinths and flowering trees. The park is on sensory overload at this time with the aroma and the visual beauty. There are over 3,000 species of plants in addition to the 500 animals. As much as you might want to take photos, the kids are going to love this place as well. Parent’s Magazine recently named this as one of the top ten best zoos for kids. Zagat Survey also named this as one of the top zoos in the country. The zoo is open daily from 9:00 a.m. until 5:00 p.m. except on Christmas Day. Admission for adults and those over 12 is $14.00. Children from 2 through 12 and seniors are $9.00. For more information check their Website at http://cincinnatizoo.org. Driving from Cleveland? It’s an easy 4 hour – approximately 250 mile ride down I-71. Why not make a weekend of it? Tomorrow’s article will be more things to do in Cincinnati – check back.